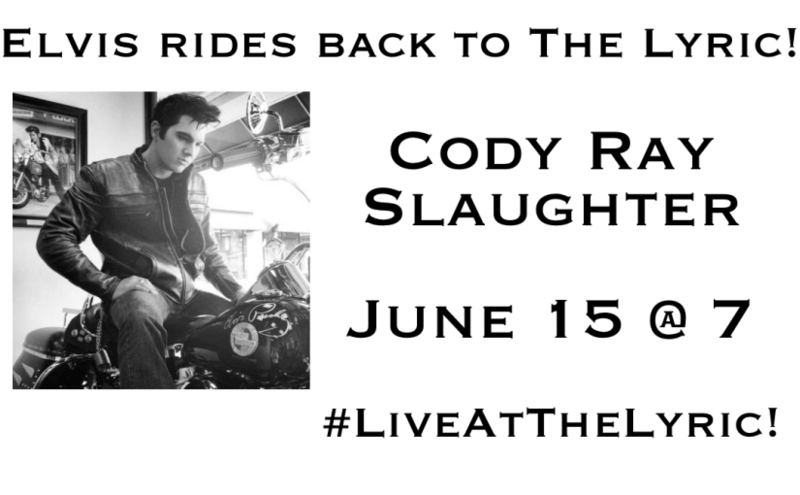 Cody Ray Slaughter in Concert — Saturday, June 15 at 7:00pm — #LiveAtTheLyric! Cody Ray Slaughter is a Harrison original: a true Southern boy whose passion for the music and memory of Elvis has driven him to a life dedicated to serving the King’s fans. 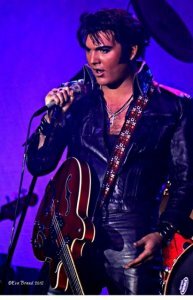 Cody has performed all across the country as “Elvis” in the traveling production of the Tony Award-winning sensation “Million Dollar Quartet” and was nominated as best featured actor for his role. 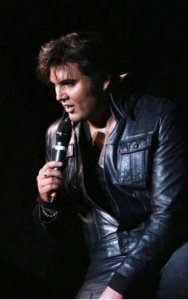 This June 15, he returns home to Harrison’s historic Lyric Theater with the raw talent and passion that Elvis himself exhibited. Tickets go on sale online at 12:01 am on Saturday, March 16 and the Lyric box office will be open to sell tickets for his concert to those attending the Lyric’s 90th Anniversary concert with Guinness World Record setter Screamin’ Freeman that evening. 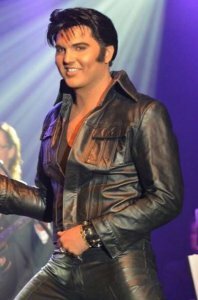 Representing Tupelo, Mississippi (Elvis’ Birthplace) Elvis Presley Enterprises’ named Cody the 2011 ‘Ultimate Elvis Tribute Artist’ in Memphis TN in 2011. The doors of the Roots Music Palace of the Ozarks—Harrison, Arkansas’s historic Lyric Theater—will open at 6:00 for a 7:00 performance on Saturday, June 15. Adult beverages and general concessions will be available throughout the concert, and tickets are available in advance for $25.00–$35.00; at the door, they will be $5 more. Posted on March 13, 2019 March 13, 2019 Author WebmasterCategories Americana, Americana, Blues, Blues-Rock, Concert, Country, Folk, Gospel, R & B, Rock, Skiffle, Standards, SwingTags americana, blues, classic rock, concert, concert-current, country, featured, Gospel, music, R & B, rock, showsLeave a comment on Cody Ray Slaughter in Concert — Saturday, June 15 at 7:00pm — #LiveAtTheLyric! 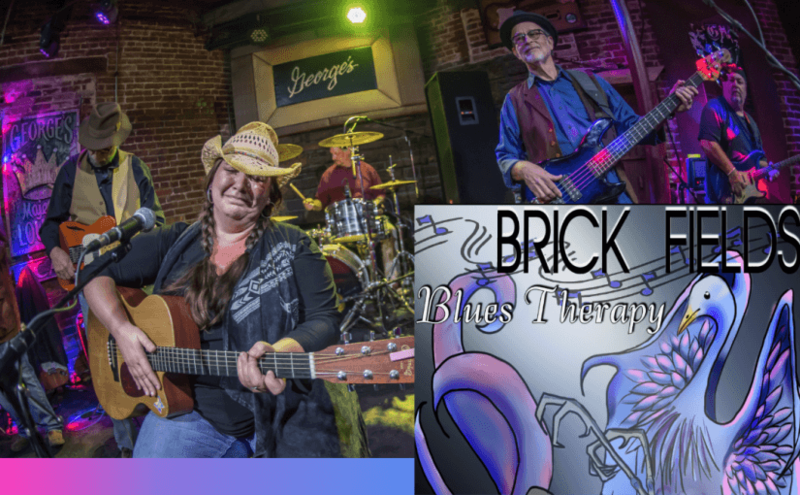 Brick Fields: Blues Therapy – April 5 @ 7:00 – #LiveAtTheLyric! Brick Fields is Coming to the Lyric! Brick Fields is an Arkansas original musical group fronted by the ambrosial voice of Rachel Fields. With her husband, Larry Brick, who has spent over 40 years in the music business as a guitar player and songwriter (and was a worship leader during the California Calvary movement of the 1970s), there is a ‘two talents expressing one flesh’ vibe throughout the music—a unity of purpose in music and vocals that is neither forced nor self-conscious, but just is. 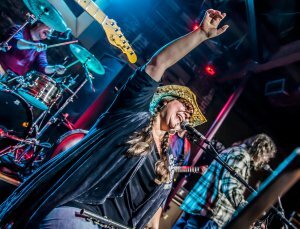 Rachel cut her musical teeth first in the Arkansas River valley, by way of her Uncle Mike “Burger” Scoggins, then in the jam band circuit touring in the late ’90s east and west coast festivals, opening for acts like Government Mule and later singing on a tour with the Jerry Garcia Band. Together, they bring a true Americana Soul feel—weaving Folk, Gospel, and Blues together in such a way that former Buffalo River Concert Association president Rick Hinterheuer told Rachel, “You’re going to have a good time playing at the Lyric!”…because Rick knows what we like! 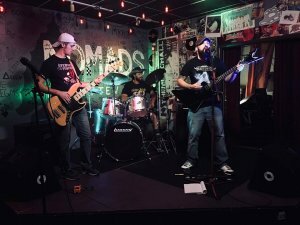 Brick Fields’ current core band is a treasure of solid creativity including Ben Sass, Kevin Bonner, Hoobie Daniels, and Chris Parker. Ben Sass of Jerusalem, Israel is the vibrant enthusiastic steed on and off stage, possibly one of the world’s finest up-and-coming harmonica players on the scene. Kevin Bonner is from Northwest Arkansas and honed his drumming chops in the Cate Bro’s garage; he has been the backbone for numerous of NWA’s most loved bands. Bass player, Hoobie Daniels, of Southern Mississippi (via Austin Texas), joined Brick Fields in 2016 after retiring to the Ozark Mountains where he is continuing his musical journey. Chris Parker adds his Tulsa guitar stylings with influences that largely play themselves out between Chet Atkins and BB King. Comfortable with themselves and numerous surprise guests, it’s not unusual at a Brick Fields show for the night to end with a few or as many as 20 players on stage. 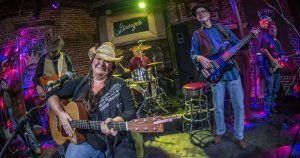 As musicians’ musicians, Brick Fields has been called a magnet for other musicians and music lovers alike. Ever evolving, this couple’s original music can charm venues in an intimate relaxed setting with the acoustic duo telling stories of musical roots or bring a full-on band experience that brings the house to its feet. 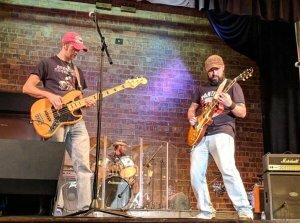 The Ozark Arts Council is pleased to welcome Brick Fields to The Roots Music Palace of the Ozarks, Harrison’s historic Lyric Theater, on Friday, April 5 at 7:00. Tickets are just $10 in advance, but $15 at the door; just click any of the ‘Get Tickets’ links here on our website and you’ll be taken to our ticketing page, or call Jules or Dill at (870) 391-3504 or visit Dill at the OAC office M-W-F 8:00–2:00 (or Jules by appointment). Posted on February 25, 2019 April 13, 2019 Author WebmasterCategories Americana, Americana, Blues, Concert, Folk, Gospel, R & BTags archive, blues, classic, concert, folk, Gospel, music, R & BLeave a comment on Brick Fields: Blues Therapy – April 5 @ 7:00 – #LiveAtTheLyric! Leadfoot 65 – March 30 @ 7:30 – #LiveAtTheLyric! Put the Pedal to the Metal and Keep on Rockin’ with Leadfoot 65! 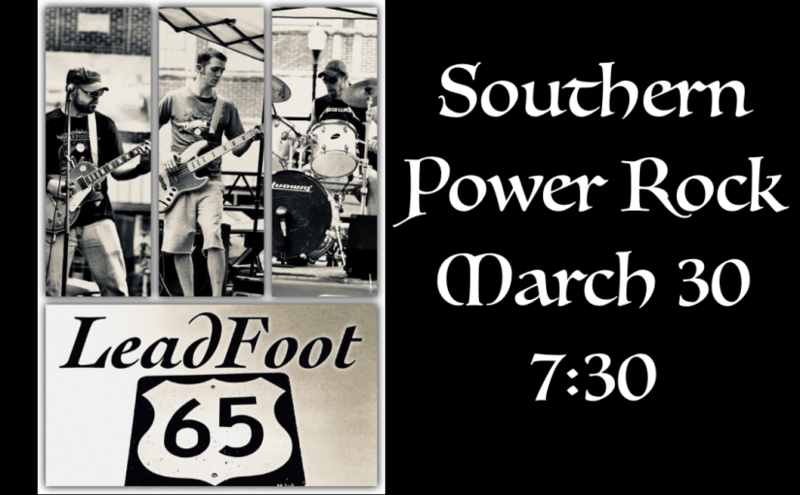 Join us on March 30 at 7:30, as Leadfoot 65 speeds onto the Lyric stage! If you heard them at last Summer’s Battle of the Bands or elsewhere, you know that they waste no time in getting your adrenalin flowing and keep it building throughout their set with both riffs and lyrics so solid that you not only can taste the music in the theater’s rarefied air, but chew on it all the way home and through the weekend. As the title track from their just-released second album says, there is “More than Meets the Eye” in the rock from Tomahawk! Sean Bing’s vocals are a good match for his guitar playing. Even in something as ‘pretty’ as the introduction to “Black Smoke Rollin’” (and later, in the melodic solo), there is an edge and you know that at any moment it could become all edge; Sean can actually both sing and growl — with both instruments — and he knows when to do each (or both) for best effect. At the same time, Skip Reed’s drum work and Nathan Popejoy’s bass are singing their own deep and steady song for Sean to play off of. This is a great rhythm section and a guitarist that has a feel for how to keep attached to what they’re playing, not just go off and show off his chops in some barely-related way. If you like rock music that puts the emphasis on both the music and the rock, you will love Leadfoot 65. Leadfoot 65’s two albums reveal a band that is bringing in what we might call ‘The New Mainstream of Southern Rock’. That is, they display a broad set of roots and influences that include the same background as the earlier wave of Southern rockers, plus all the music that has come since then. They move easily from a Molly Hatchet-like sound to one that is clearly akin to Pantera, without ever falling into the sometime-muddiness of Dixie Witch. Southern Rock with a power groove and the soloing sensibilities of melodic and neo-classical metal without losing the focus of the main musical and lyrical intent; Leadfoot 65 is clearly ‘coming of age’ and not to be missed. The Ozark Arts Council is pleased to welcome Leadfoot 65 back to the historic Lyric Theater on Saturday, March 30 at 7:30. Tickets are just $5 in advance, but $10 at the door; just click any of the ‘Get Tickets’ links here on our website and you’ll be taken to our ticketing page, or call Jules or Dill at (870) 391-3504 or visit Dill at the OAC office M-W-F 8:00–2:00 (or Jules by appointment). Posted on February 23, 2019 April 3, 2019 Author WebmasterCategories Blues-Rock, Concert, Metal, Rock, Southern RockTags archive, blues-rock, classic rock, concert, hard rock, metal, music, rock, southern rockLeave a comment on Leadfoot 65 – March 30 @ 7:30 – #LiveAtTheLyric! 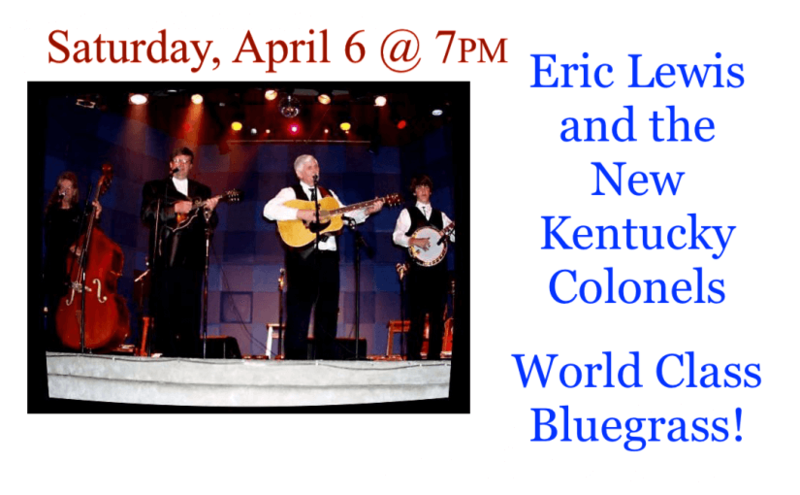 New Kentucky Colonels – April 6 @ 7:00 – #LiveAtTheLyric! 135 Years of Bluegrass Excellence on One Stage! The New Kentucky Colonels! 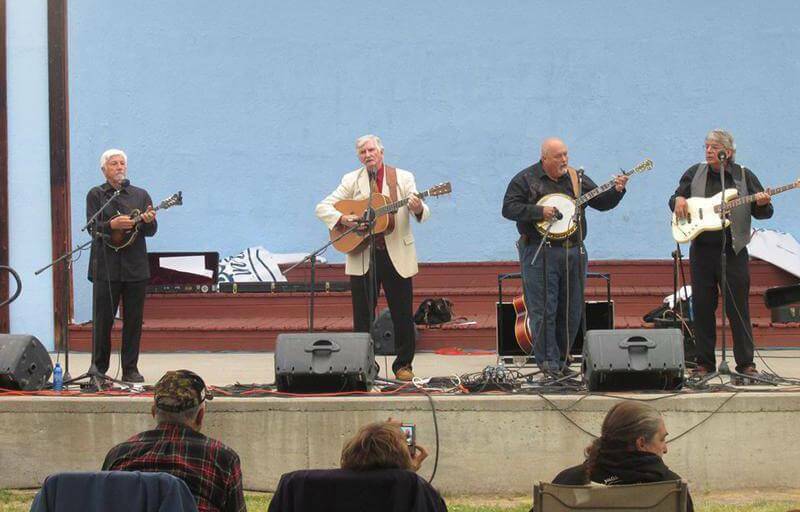 The New Kentucky Colonels are a premier bluegrass group with over 135 years of musical talent. They tour nationally across the US each year and have played internationally, as well. Leader Eric Lewis has been in love with country and bluegrass music ever since he heard the Grand Ole Opry in 1950 as a 7-year old. He began to play at music parties in the early 1960’s at people’s homes, and later in contests. 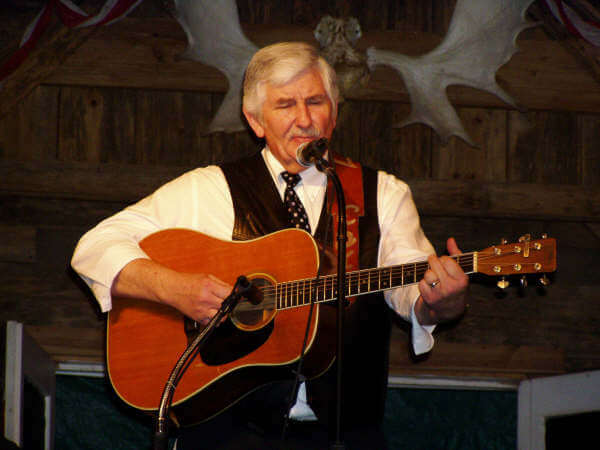 In 1979 he joined the Heart of the Ozarks Bluegrass Association and formed his group, Southern Grass (later called, Southern Missouri Bluegrass) in 1981. 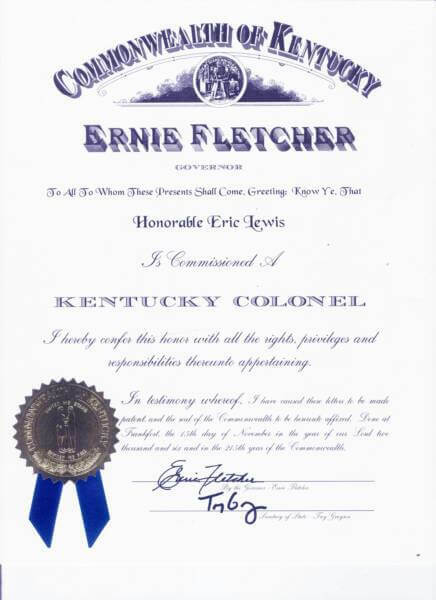 In 2006, Mr. Lewis was commissioned a Kentucky Colonel and the group began booking as New Kentucky Colonels, They perform bluegrass, country, old time, gospel and the best in family comedy. Over the past 38 years, a number of people have been part of the group and Eric has performed with many of the names in the business, has won several awards, has written and recorded several CD projects, and had his own live television show for several years in Arkansas and Missouri. Eric is an honorary member of the Country Music Hall of Fame in Nashville, founded the George D. Hay Society at West Plains, MO (a historical society to preserve the Ozarks’ history and heritage). With his connection to the Grand Ole Opry, in 2005 he presented a lifetime achievement award to Louise and Earl Scruggs at the Country Music Hall of Fame. Current members of the band include Gary Shipley, Dennis Reese, and Corky Dow. Gary Shipley was born and raised in Granby, MO. He began playing and singing at an early age and plays multiple instruments—guitar, banjo, and dobro. Gary sings lead and harmony with the group, having re-joined the New Kentucky Colonels in 2016. Dennis Reese was born and raised in Mammoth Spring, AR and began playing the bass at an early age. He has played with several different people in his many years of music and is an accomplished musician and a great asset to the group, Dennis now resides in Alton, MO and has played for the group for two years. Corky Dow was raised in Alaska and has played most of his life. He previously performed with the group, The Fabulous Back Roads Drifters. Corky plays mandolin, writes songs, and sings lead and harmony, having joined New Kentucky Colonels in 2016. Saturday, April 6 is the date and tickets are $15 in advance ($12 for seniors), whether online or at the OAC Office (115 W. Rush, just to the left of the theater; hours 8–2, M-W-F; phone 870-391-3504) and $20 ($15 for seniors) at the door. Posted on February 20, 2019 April 13, 2019 Author WebmasterCategories Bluegrass, ConcertTags americana, archive, bluegrass, concert, country, folk, guitar, musicLeave a comment on New Kentucky Colonels – April 6 @ 7:00 – #LiveAtTheLyric! 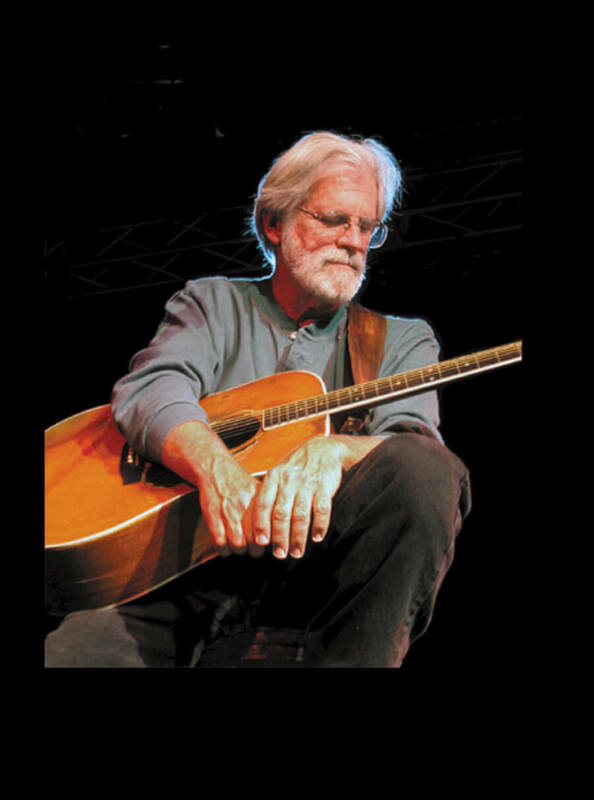 Jack Williams – February 8 @ 7:00 – #LiveAtTheLyric! Jack Is Back! Singer-Songwriter Extraordinaire, Jack Williams, Once Again “Live at The Lyric”! Crooked Creek Concerts and the Ozark Arts Council are proud to welcome the mighty Jack Williams back to the Lyric Theater! 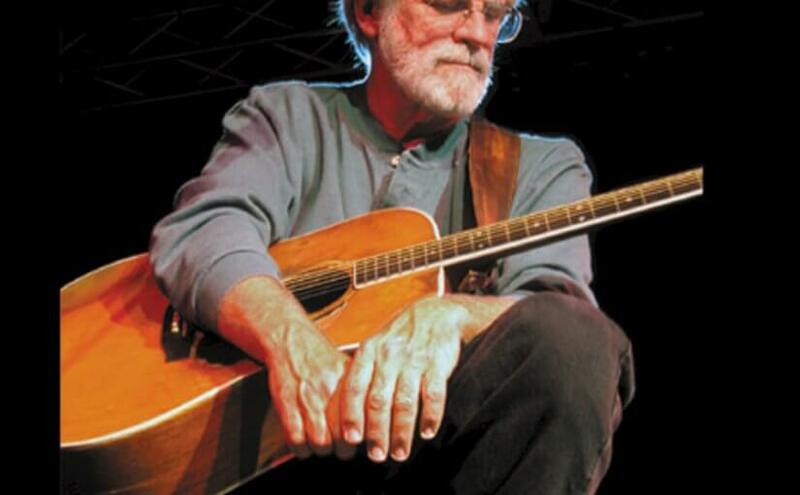 Jack Williams is a songwriter, singer, and guitarist with few (if any) peers. HIs songs are a literary record of the joy, brilliance, disappointments, and aspirations of our American experience. His live shows romp through the melodic and lyric wit of the Jazz Era, the sentimental strains of doo-wop, and the birth of rock and roll. This is all set against the backdrop of steamy South Carolina, the wilds of the Sonoran desert, and vast stretches of interstate… on and on he’ll go, until you find yourself in Mama Lou’s kitchen with her wood-fired stove, breathing in the scent of maternal love in the form of fried chicken. Friday, February 8 is the date and tickets are $10 in advance, whether online or at the OAC Office (115 W. Rush, just to the left of the theater; hours 8–2, M-W-F; phone 870-391-3504) and $15 at the door. worlds of blues, country, rock and roll and jazz together on an acoustic guitar, I’ve never heard his equal. Jack is the best guitar-player I’ve ever heard. Posted on February 6, 2019 February 10, 2019 Author WebmasterCategories Blues, Blues-Rock, Concert, R & B, RockTags americana, archive, blues, concert, folk, guitar, music, singer-songwriter, world famousLeave a comment on Jack Williams – February 8 @ 7:00 – #LiveAtTheLyric! 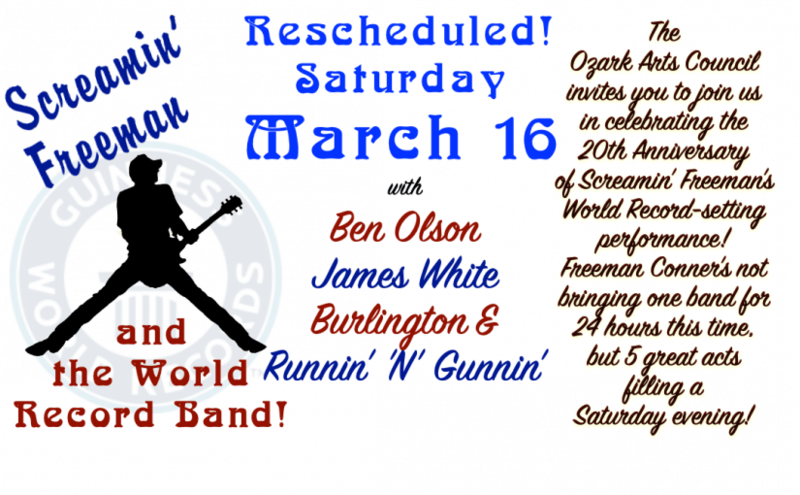 Screamin’ Freeman’s World Record 20th Anniversary Concert — Saturday, March 16 at 7:00pm — #LiveAtTheLyric! Screamin’ Freeman and the World Record Band! In 1999, Screamin’ Freeman laid claim to providing “Non-stop fun! Non-stop rock! and Non-stop Screamin’ excitement!” that no one else could match—and then Freeman Conner and his World Record Band proved that claim to be true even to the satisfaction of the Guinness Book of World Records, which noted their non-stop performance (shown at right on the Lyric’s then-much-smaller stage) as the longest continuous performance by a musical group. The band’s goal wasn’t only the setting of a world record, though: it was to help the Ozark Arts Council raise both money and awareness to make it possible to purchase the theater and transform it into the venue for live music, drama, and education that we all love today—and now it’s time to celebrate that historic concert and all the entertainment that followed it these past 20 years! “The ever intense Mr. Screamin’ Freeman Conner”—lead guitarist, lead vocalist, harp player, songwriter, arranger, schmoozer, original in every sense of the word—is clear on why he leads a band that is no less intense today than it was in the ’90s: “The energy of the three piece band and the adrenaline rush from playing non-stop is why I do it.” What keeps the band “electric,” Freeman says, is John “Metronome” Schaffer, whose unfailing beat keeps the band tight from start to finish. With John’s steadiness, “The artist known as Paul” Woolston’s Fender P-Bass drives the music with every bit of intense energy that Fender’s naming it “Precision-Bass” was meant to convey: Precision = Power! Powerful rock and blues classics and the band’s own compositions drive up the excitement all night long. Of course, Freeman is not the sort of guy to do things at the ‘exciting’ level if he has the opportunity to do them at the ‘super, massively exciting‘ level, so he is bringing in four great acts to make sure the celebration is even more memorable! Joined by Ben Olson, James White, Burlington, and Runnin’ N Gunnin’, Screamin’ Freeman is once again bringing a massive party to the Lyric stage! The doors of the Roots Music Palace of the Ozarks—Harrison, Arkansas’s historic Lyric Theater—will open at 6:00 for a 7:00 performance on Saturday, March 16. Adult beverages and general concessions will be available throughout the concert, and tickets for this FIVE BAND 20th ANNIVERSARY EXTRAVAGANZA are available in advance for $15.00; at the door, they will be $20. Posted on January 5, 2019 April 13, 2019 Author WebmasterCategories Alternative, Americana, Americana, Blues, Blues-Rock, Concert, Country, Folk, R & B, Rock, SkiffleTags alt rock, alternative, americana, archive, blues, classic rock, concert, music, rock, showsLeave a comment on Screamin’ Freeman’s World Record 20th Anniversary Concert — Saturday, March 16 at 7:00pm — #LiveAtTheLyric! 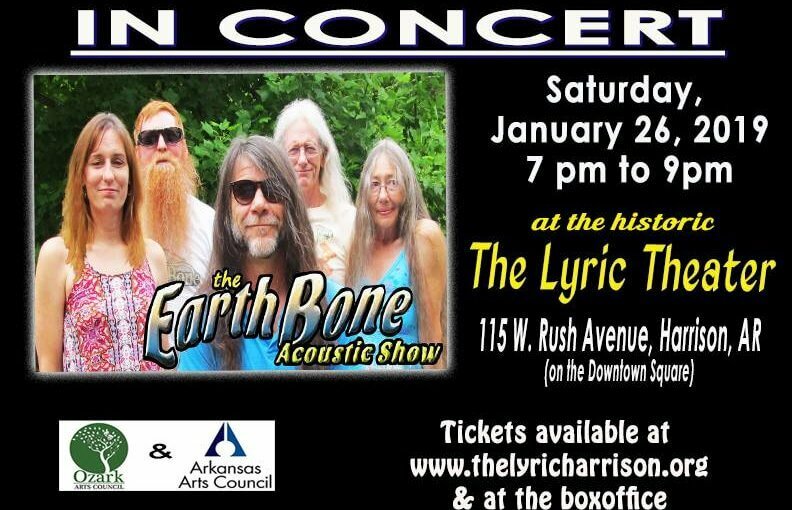 Earth Bone in Concert — Saturday, January 26 at 7:00pm — #LiveAtTheLyric! 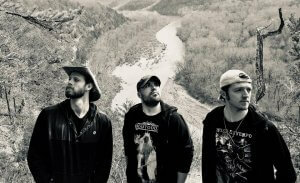 Earth Bone has an eclectic repertoire of multi-genre originals and uniquely played crowd-pleasing favorites that have been described as “Power Folk with a touch of funk.” From early rock classics to modern pop and rock, Earth Bone covers quite a lot of ground! 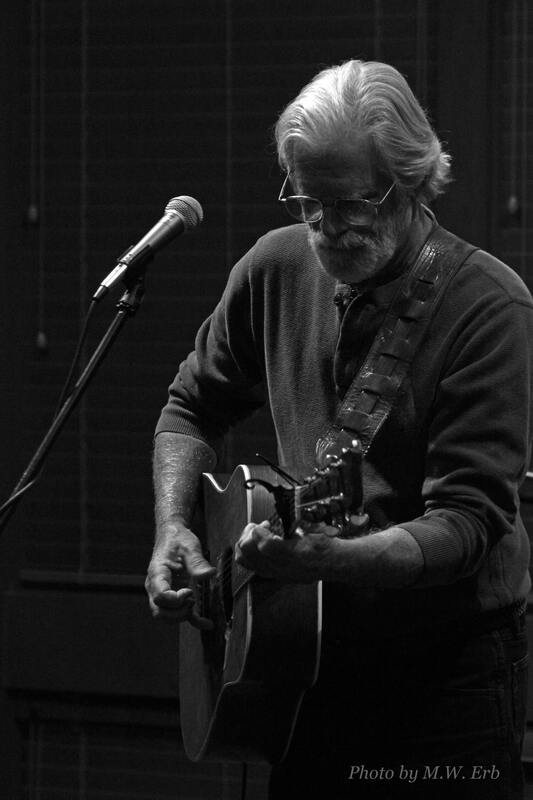 Armed with an incredible voice, Jerry Rowan has no fear in front of a microphone and always gives 150% every show. 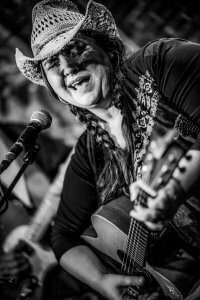 He is matched vocally by Susan Boone whose renditions of blues and ballads are exciting to hear to say the least. Dave Dore ties it all together with his vocals, keyboard and guitar. Wayne Angel’s conga, djembe and cajon riffs add a taste of the exotic to all of Earth Bone’s songs. The band is often joined by Denise Dore, who provides strong backup vocals. Most of the originals are written by Jerry, Dave and Susan and each song reflects a bit of what makes this group so exceptional. The doors of the Roots Music Palace of the Ozarks—Harrison, Arkansas’s historic Lyric Theater—will open at 6:00 for a 7:00 performance on Saturday, January 26. Adult beverages and general concessions will be available throughout the concert, and tickets are available in advance for $5.00; at the door, they will be $10. Posted on December 27, 2018 February 1, 2019 Author WebmasterCategories Alternative, Americana, Americana, Blues, Blues-Rock, Concert, Country, Folk, R & B, Rock, SkiffleTags alt rock, alternative, americana, archive, blues, classic rock, concert, music, rock, showsLeave a comment on Earth Bone in Concert — Saturday, January 26 at 7:00pm — #LiveAtTheLyric! 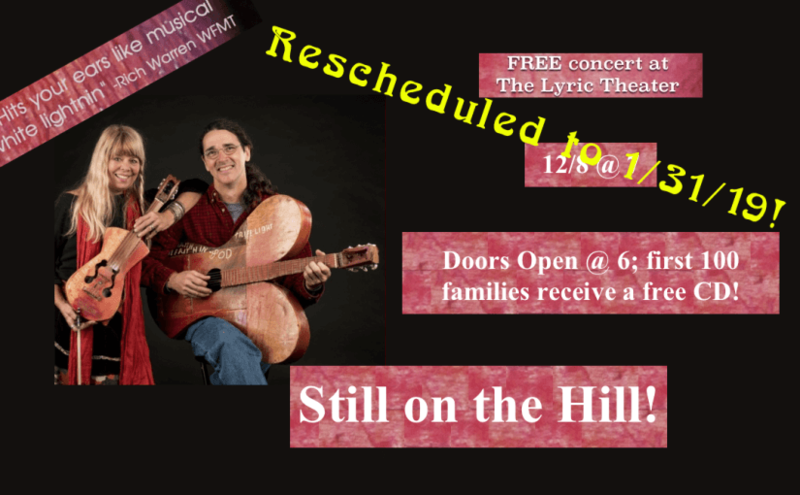 Still on the Hill — Thursday, January 31 at 7:00 — #Live at the Lyric! Roots Music Palace of the Ozarks! Kelly & Donna Mulhollan of Still on the Hill are award winning ‘story telling-song writers’. Different from most singer-songwriters, these “Ambassadors of the Ozarks” embellish their songs with a host of unique instruments made right here in the hills that we call home. Many of these were hand-made by old-timers and have amazing stories that come with them! Posted on November 27, 2018 February 6, 2019 Author WebmasterCategories Alternative, Americana, Bluegrass, Celtic, Concert, Country, FolkTags archive, concertLeave a comment on Still on the Hill — Thursday, January 31 at 7:00 — #Live at the Lyric! Sanctuary Benefit Concert — Saturday, October 13 at 3:00–8:00pm — #LiveAtTheLyric! Light Up Harrison, the OAC, and the Bands! Three bands that have consistently kept crowds coming back for more have banded together to support victims of domestic abuse by helping Sanctuary provide food and shelter. Sponsored by Light Up Harrison, which is committed not only to the lighting of the Square and streets of Harrison for the Christmas season, but to keep aglow the light of our area’s residents’ love for those in need, these excellent bands will perform to raise cash and food donations on Saturday, October 13, from 3:00–8:00. Sanctuary will be able to continue in its mission of providing for those escaping abuse and Light Up Harrison will continue to show the world that our area takes seriously our duty to recognize and enhance all that is good, noble, and beautiful. The OAC remains committed to the contention that great art most often comes from great passion—which is, literally, great suffering, whether from agony or from ecstasy—so that the Arts help us to heal and to thrive, to turn victimization to survival and survival to triumph. The doors of the Roots Music Palace of the Ozarks—Harrison, Arkansas’s historic Lyric Theater—will open at 2:00 for a performance stretching from 3:00 to 8:00 on Saturday, October 13. Adult beverages and general concessions will be available throughout this concert, and there will be short (5–10 minute) intermissions between bands, as well. Tickets are available in advance for $2.50 and two food items* or for $5; at the door, they will be $5 and two food items. The Benefit Concert for Sanctuary, sponsored by Light Up Harrison, will begin at 3:00 on Saturday, October 13, and run from 3:00–8:00. The doors of Harrison’s historic Lyric Theater will open at 2:00 and adult beverages and general concessions will be available throughout the evening. 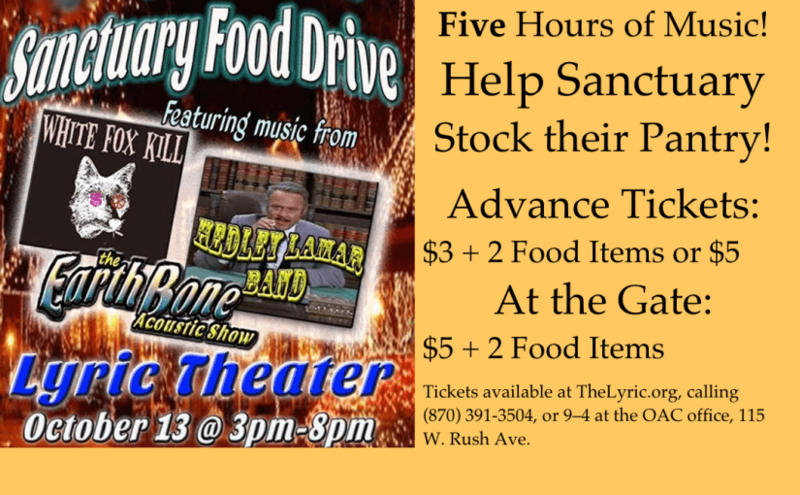 Tickets are available in advance online, at (870) 391-3504, or 9–4 weekdays at the OAC office (door to the left of the theater) for $2.50 and two food items or $5.00*; at the door, they will be $5 plus two food items. *Please just bring the food items with you and don’t try to send them through our ticketing page; last time, someone tried to send a jar of strawberry preserves and it really gummed up our server. Posted on October 3, 2018 October 19, 2018 Author WebmasterCategories Alternative, Americana, Americana, Blues, Blues-Rock, Concert, Country, Folk, R & B, Rock, SkiffleTags alt rock, alternative, americana, archive, blues, classic rock, concert, music, rock, showsLeave a comment on Sanctuary Benefit Concert — Saturday, October 13 at 3:00–8:00pm — #LiveAtTheLyric! Smokey & The Mirror — Saturday October 6 at 7pm — #LiveAtTheLyric! 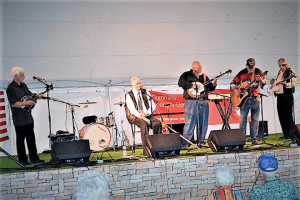 Crooked Creek Concert Association presents Fayetteville Roots Festival founders, Smokey & The Mirror, who will perform at the Roots Music Palace of the Ozarks, Harrison, Arkansas’s historic Lyric Theater, on October 6 at 7:00PM. Tickets are available in advance for $10; at the door, they will be $15. 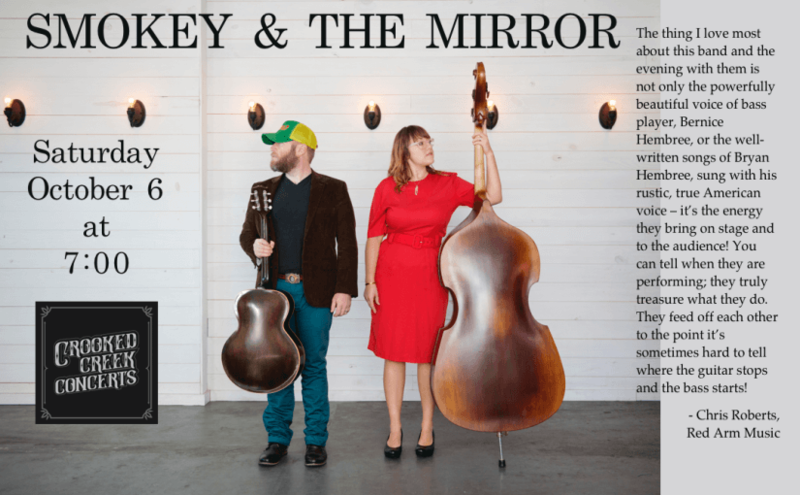 Smokey & The Mirror is husband/wife duo Bryan and Bernice Hembree. Based out of Fayetteville, Arkansas, Smokey & The Mirror has toured nationally and internationally over the past decade. The band has supported tours for Old Crow Medicine Show, The Wood Brothers, I’m With Her, Elephant Revival, John Fullbright, and many of their musical heroes. They tour most often as a duo, but also play many shows as a four-piece band. Whatever the configuration, the interplay of their two unique voices coupled with engaging, accessible songs form the foundation of Smokey & The Mirror. The Hembrees work tirelessly on many musical and creative pursuits. They are committed to others’ music as much as their own. They have found that the most satisfying path to longevity in music is to put others’ art in the spotlight or to inspire others’ to find their voice. They believe that the future of music is not winning the “me first” battle, but rather building community. To this end, they are founders and co-creators of the Fayetteville Roots Festival and also spent a year (2017) with Austin-based international songwriting collaborative, House of Songs, to pilot House of Songs Ozarks in Bentonville, Arkansas. Posted on September 26, 2018 October 19, 2018 Author WebmasterCategories Americana, Americana, Blues, Concert, FolkTags americana, archive, blues, concert, country, crooked creek, folk, folk music, music, showsLeave a comment on Smokey & The Mirror — Saturday October 6 at 7pm — #LiveAtTheLyric!